Unfortunately, I have to say that members of the Santa Cruz City Council don't quite seem to understand this basic concept. Voters elect local officials to listen to them (the voters and residents), and then to try to operate their local government in ways that best respond to what the local voters want. City officials and consultants, of course, can provide invaluable assistance, and often have worthwhile suggestions, but who should be steering the ship? 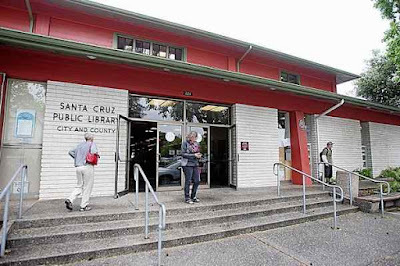 Recently, I watched the Santa Cruz City Council decide (with two dissents) to abandon its downtown library (pictured above). In 2016, voters passed a library bond issue to "support the modernizing, upgrading and repairing of the Aptos, Boulder Creek, Branciforte, Capitola, downtown Santa Cruz, Felton, Garfield Park, La Selva Beach, Live Oak and Scotts Valley library branches, as needed." This description of the objectives of the bond issue comes from a pre-election article in the local newspaper, the Santa Cruz Sentinel. No mention of a new library was ever suggested, as the voters authorized money for needed "upgrading, repairing, and modernizing." After voter approval, with something like $23 million dollars made available from the bond issue, the City Manager suddenly decided that idea of "upgrading, repairing, and modernizing" our existing downtown library was not what should happen, at all. Instead, the City Manager decided that the city should build a brand-new new library, which would be located in, under, or in conjunction with a huge, multi-story parking garage. This Garage/Library plan, if implemented, will completely abandon the current downtown library site (with no announced indication of what might happen to that site, located immediately across the street from City Hall). The plan would also require the destruction of an existing city-owned surface parking lot that has served as an informal "community plaza," where an extremely popular weekly Farmers' Market is held. Huge and beautiful heritage trees (a couple of hundred years old, by some estimates) will have to be destroyed to turn that informal plaza and surface parking lot into a multi-story parking garage. The plan to "bury the library," as opponents designated it, was wholly derived from ideas coming from the City bureaucracy, and most notably from the City Manager, who then enlisted a brand-new Library Director, the City's Public Works Department, and the City's Economic Development Director to say that this was a super good thing for the city, particularly because it would stimulate economic growth and (allegedly) provide assistance to affordable housing developments. Those with just the slightest degree of skepticism, despite bureaucratic claims to the contrary, looked upon this plan as the City Manager's way to rip off library funds to help build a parking garage much needed by development interests, who didn't want to pay for required new parking themselves. In all fairness, there were some good arguments advanced by the staff, and there was some community support for this plan, too. What struck me, however, was the way that the Mayor and City Council rolled over and brushed aside heartfelt community objections. After giving the city staff a long opportunity to say why their idea was so good, individual members of the public were then each given 90 seconds to raise concerns. As soon as the public comment period was over, the Council quickly moved to adopt the City Manager's plan. Maybe the City Manager's plan is a good plan (though I truly doubt it), but what was most disheartening to me was to see the way that the plans of the bureaucrats were elevated so much above the quite legitimate concerns voiced by members of the public (even though members of the public got only a 90-second snippet to make their points). I keep a pretty close watch on what my local City Council does, and how it operates. Unfortunately, this recent decision is one of many in which I can't help but conclude that the Mayor and Council Members (with a couple of dissents) essentially see their role as telling city voters how great the city is being managed by the city staff, instead of telling the city staff what the public wants. "Remember You're In Charge.” There is a bureaucratic momentum present in every institution (certainly including government). An elected official needs to remember that he or she was elected to run the bureaucracy not the other way around. If this was an isolated case of ignoring the concerns and preferences of the electorate, I MIGHT be able to give them a pass. However, after sitting through countless City Council meetings where life-changing issues were debated and having them ALL voted down, despite numerous objections (90-120 seconds each) were patently ignored in favor of the City government bureaucrats, I cannot stomach this trend. It is the most undemocratic, ignorant and yet corrupt City Council I have witnessed in my 50 years of living here. Rental Control, Commercial Cell phone towers, unwelcome neighborhood greenways, Unattractive units going up near the river, high rises, corridor crowding, lack of accessible low rent units, etc.etc. are ruining this fabric of this community wholesale. The old library will be needed for all the new bureaucrats to house themselves. Let's get real here. This City Council will go down in history as the one which tarnished the wholesome and original City of Santa Cruz. Let us pray. We're going to need it. thanks for this forum.